MyWay Mobile Storage donates portable storage units to 2017 Annapolis Running Classic for 3rd consecutive year. The 2017 Annapolis Running Classic took place on Saturday Nov. 18th at the Navy-Marine Corps Memorial Stadium in Annapolis, MD. The event features both a half marathon and a 10K for runners who will enjoy the scenic waterfront views of historic Downtown Annapolis. The event is capped at 4,000 Half Marathon runners and 1,000 10K runners. The course will start and finish at Navy-Marine Corps Memorial Stadium. The Running Classic also includes a Post-Race party where soup, oysters, and local beer from Fordham brewery will be served. All finishers will receive a commemorative metal and enjoy local live music from area bands. MyWay Mobile Storage donated two portable storage units for the event staff’s use. 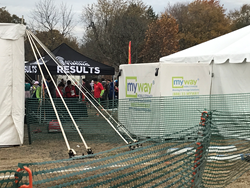 This marks the 7th consecutive year that the Annapolis Running Classic has utilized MyWay Mobile Storage units for the event and the 3rd year that MyWay has donated their service. Proceeds of the Annapolis Running Classic have and will benefit local 501(c) organizations in Annapolis. Over $220,000 has been donated to local organizations in the first five years of the event. Charities who have received the benefits include; Anne Arundel Medical Center, FoodLink, YMCA, U.S. Naval Sea Cadet Corps, Orphan Grain Train, Seeds4Success, YoungLife Anne Arundel County, Wellness House of Annapolis and the Children’s Theatre of Annapolis. MyWay Mobile Storage is the leading provider of moving and storage solutions. They provide quick and easy do it yourself moving containers that can be delivered right to your door and stored in their climate controlled, secure storage facilities. To learn more visit http://www.mywaystorage.com or call (888) 336-9929 to speak with a Moving & Storage Consultant.